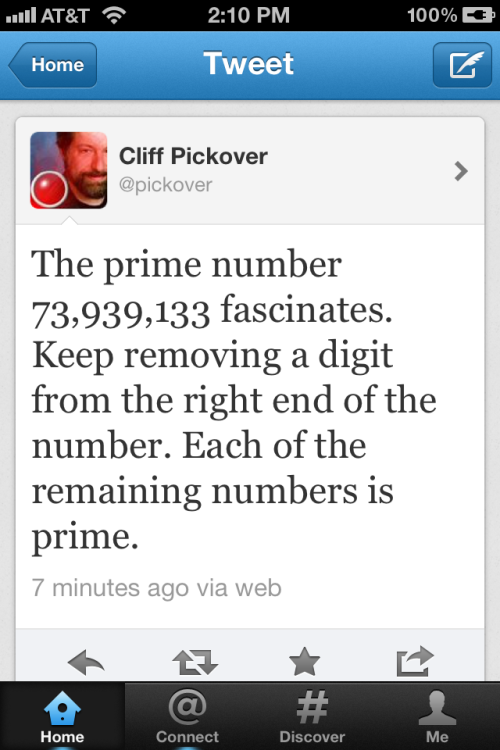 There are also five other primes of the same number of digits with this property: 23,399,339; 29,399,999; 37,337,999; and 59,393,339. Daniel Dockery, please help me find better sequences. The last digit remains 7; for numbers of more than one digit, the final two digits remain 47; for numbers with more than two digits, the final three remain 247. For numbers of more than three digits, the fourth-to-the-last digit alternates between 1 and 6 (1 for even x [see below, for how to generate the sequence, to see what I mean by x], 6 for odd). For numbers of more than four digits, the fifth-to-the-last digit repeats the sequence: 3, 5, 8, 0. More than five digits, and the sixth-to-last digit repeats: 1, 7, 9, 5, 6, 2, 4, 0. More than six, the seventh-to-last repeats: 3, 9, 7, 8, 1, 7, 5, 5, 8, 4, 2, 3, 6, 2, 0, 0. And so on. The sequence is generated simply by taking p(5,5x)/5 for x=1,2,3…n (n was stopped arbitrarily at 100 in the above example list). If you want to skip the polygonal number function altogether, you can render the above sequence with f(x) = 2*5x-3. I included the reference to the polygonal numbers simply to show the source from which I derived the sequence. If you define a generalized function f(x,y) → ((10^x)^y - 1) / (10^x - 1), then you can generate the above by evaluating f(3,y) × f(2,y-1) for successive values of y > 2. In case the “jumble” of numbers aren’t very clear for some, I rendered a quick image of the sequence colored to show the distribution of prime digits: white areas (inside the general triangle shape) represent non-primes, black areas are the digits 0 and 1; primes are in red.